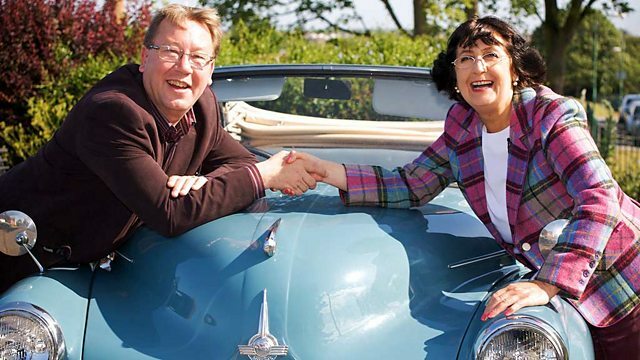 Antiques experts Anita Manning and James Braxton travel through Essex on the third leg of their road trip. James is feeling flush, but will Anita beat him at auction? a classic car, and a goal to scour Britain for antiques. vie for the gaudy hearts of Essex. Anita Manning is a canny Scotswoman with a keen eye for tiny treasures. I'm still a hard man underneath it all. Yes! Oh, James, that was great! ..James is riding high, but anything can happen in this game. You, you've got loads of money. Oh, do pipe down. It's so vulgar. in our nation's fine capital. in that same celebrated county. We're in Essex and we must top up our tans, mustn't we? Look, this isn't that sort of show, James. attractive historic buildings and a busy market. A delightful place for James and Anita to begin their day. to begin the day's shop. A beautiful market town and where are you going, Anita? -I'm going that way and you're going that way. -Off we go. Good luck. Anita is strolling off through the town's sunny Market Square. -Hello, ladies! How are you? but Anita's already spied something in the window display. The mah jong set looks interesting. -It is and that's quite new in, actually. -Would it be possible to see the mah jong set out? -It is quite fun. It's a game, we're playing a game. it may have emerged in its modern form as late as the 19th century. Gameplay is similar in some ways to the card game rummy. and the symbols on it. "Directions of playing Chinese Game of Four Winds." -Do you know anything about the game? -There's up to four players. -I'm not a card player. I can play snap. My imagination has been captured by this. -Is it a leather case? -But that's not in the best of condition. -It's probably from about the 1940s, would you say? I'd be estimating it round about £20. -Is it possible to buy it anywhere near that figure, ladies? We've got 48 on that at the moment. -Aw! Thank you very much. -Go on, we'll do 20. Lovely. Thank you both, ladies, thank you. and the mah jong set is hers. -Antique Attic, where he'll be helped by dealer Sam. -Sam, nice to meet you. -Hello, Sam, very nice to meet you. which houses items belonging to many dealers. First impressions is there's some nice pictures. probably can be bought reasonably. Don't pull that face at me! but he has seen something he hopes might post a profit. There might be interest in those. They're books of old British stamps, unused. -You can still use them. 3p...that'd get you down the road, wouldn't it?! before and after the decimalisation of UK currency in 1971. -Do you think she might do them for a fiver? -Yeah, I'm sure she would. That deal has stuck, but, shortly, he's alighted on something else. You see, this is quite nice, 1960s, '70s. It's got bright colours, it's a nice boating scene. It's rather a nice package and it's not a lot of money, this. Stalham Boatyard in Norfolk. Ticket price is £55. It's owned by Julie, a dealer who isn't here today. -Sam will call her to see what deal can be struck. It was a picture of the boatyard. Would you accept 35 for it? How much is on it? No, I can't do 35. I'll go 40. OK, you'll go to 40. -OK, yeah, I'll take it. Ann and Brenda's pretty trinkets have caught her eye. I quite like these agate brooches. It's very Scottish. and I think they're making Anita homesick! -a look at them in the light? -Of course, yeah, yeah, do, do. Agates came from the burns and the seashores of Scotland. Edinburgh and then polished and made into these lovely brooches. fashionable in Victorian times to wear this type of item. but they're still lovely agates. Anita's thinking of assembling a job lot of the brooches. They're priced up at £7.50 each. Would it be possible...? It's 15 for the two. Could I buy them for 10? -Yeah, that will be fine. -Thank you very much! That's great! -I'm trying to buy cannily. I'm trying not to get carried away. couple of brooches hailing from her homeland. -I thought I could have a wee theme going there. -..who worked on the island of Iona. worked from the turn of the 20th century until around World War II. ancient Celtic and Nordic carvings. These are not by him. They're not signed by him. Um...but, they're...they have the same sort of feel about them. Do you know, she's thinking of adding these to her job lot. On these, what's the very best, eh...? it's in that region that I would be looking for. -If you want to have a wee think about that. -I think that would be fine. And with that, Anita's got a very patriotic lot. Ha, ha! Well, let's hope so. and the four brooches for a total of £45. -Maybe see you again. Bye-bye. the village of Little Easton. Lovely day to be out and about, isn't it? he's on his way to assignation in an empty field. the vice chairman of Little Easton Parochial Church Council. little village played during the dark days of World War II. I say, nice car, Warwick. It quite puts the 2CV to shame. -Isn't that beautiful?! Can we swap? -Why are we meeting here, Warwick? in September '43, transforming this area. dangerous bombing missions over Europe during World War II. so the first thing they had to do was to clear the land of trees. And would you believe, there were 10,000 oaks on this site? Well, actually, they literally blew them up. but a big success and played a very important part of the war effort. That's fabulous, but I'm sure there's more to the story, Warwick, isn't there? -There's a lot more to the story. Shall we? OK. Follow me. served at the airbase during the war. Warwick, how many airmen were here? Well, there was just under 3,000 - 2,888 I'm told, at one point. And did they all live on the airfield? -Yes, there was a big base up there. But they came to the church occasionally. but they came to the church for special services. And what are the uniforms we have here? -there were a lot of those. no more, suddenly being invaded by, well, 2,800-odd Americans. and the village certainly made them at home. and, you know, they were welcomed and integrated. -There were clearly dances and social occasions. You can imagine they were partying as much as they could. and they were indeed very welcome. and danger of their missions over occupied Europe. going off on these trips. What was their success rate? and just under 200 were killed, so that's a lot of casualties. is commemorated in a memorial here at the church. with the names of the nearly 200 airmen who died. the fallen US servicemen to ensure their legacy is not forgotten. These beautiful stained glass windows are the result. They were designed by an American artist called Phillips. out as a memorial some, you know, 40 years later, isn't it? come over to see where their father possibly flew their last mission. very beautiful part of Essex. We've carved out this little bit of America here. It's lovely to be able to share it to you, James. Having paid his respects, James is moving onwards. -Hello, I'm Elspeth, nice to meet you. dig into the corners and see if there are any surprises. Is she a good-looking bird? She's a bit bony if you ask me! My, Anita, you're taking your time this afternoon. You must have looked at every atom in this shop. Well, this is a bit like pulling teeth. Ah! Finally, she seems to have settled on something. What I'm looking at, at the moment, is a Portmeirion part coffee set. Portmeirion's marvellous, it's from the 1960s. This sort of stuff is so fashionable just now, I just love it to pieces. by the iconic designer Susan Williams-Ellis. There's £30 on the ticket. What sort of a deal can Anita strike? -if you could maybe do that. Elspeth will call the dealer who owns it. they have to be complete. and if I can get that, say, round about 20, I think it might not be a bad buy. Success, he's very happy to take 20 for that. £20, OK, that's absolutely fine. and she's off for a cuppa to celebrate. and headed for a well-deserved kip. and enjoying the southern sunshine. -Again, a lovely, glorious day, isn't it? Is it always like this down here, James? That's a bit of an exaggeration, James. But the sun shines on the blessed country of Scotland, doesn't it? Of course, it's always a Mediterranean climate in Glasgow! And that's a downright fib, Anita! and the incomplete Portmeirion coffee service. Well, at least Anita seems to be enjoying herself this morning. -This is it. We're on an adventure. Next, they're coming into Clare in Suffolk. the land in 1953 and still operates it today. The disembarkation of the guard. Oof! With their usual fleet-footed grace, they're splitting up to go shopping. where dealer Robin's ready to greet her. -Hi! I'm Anita, how are you? -Lovely to meet you, lovely to meet you. "Here's a man after my own heart!" and porcelain that really floats Anita's boat. greedy for all these beautiful things. They always look totally mad. What sort of price is that? -The ticket price is 3,000. -We wouldn't let it go for less than 2,500, though. -I think it's a bit dear for me. -Yeah, by just a whisker. bohemian glass...from about the 1920s, would you say? I'd personally put those circa 1900. That's where I'd put them. Round about, yeah. They have an Art Nouveau look about them and that style that I like. flourished around the turn of the 20th century. This pair of hand-decorated vases are priced up at £75. Can they be bought for around about 20 quid? I'd like to see more than that, but I think they probably can be, yeah. so she's putting them to one side and fishing for another item. I want to buy two items in this shop. Better find something else then. Ha! I think that might be slightly out of your price range. Yeah, I know, I know. That sort of thing. Hey! Enough of this messing about. We need some strong leadership! so many collectors of anything that has anything to do with Napoleon. -We have him here. That's why he's in here. -Is that why he's here, yes? We might get one walking through the door. It's a cast brass figure of French emperor Napoleon. are getting on so well, what could he do for trade? -I could do that for about 75. It's not a modern piece. I think a lot of women were. It's quite a nice thing. And it's a quality thing. ..those two? Could you do those two for 70? -Yeah, I'll do that for you. OK, thank you very, very, very much. That's great. and she's striding away with a very imperial air. -F D Salter Antiques, where he's meeting owner David. -Hello, very nice to meet you. Come on. Give me a guided tour. James is chomping at the bit for bargains this morning. -So, cheap, fresh stuff, that's what I want, David. -Fresh to market. That's a nice bit of enamel there. There's something here, I know it. But something by the window's got him seeing red. I quite like these cranberry glasses. Very pretty. They always look nice. It's got a couple of nibbles out of here. height of their popularity during the Victorian and Edwardian periods. These date from around 1900. They just look so attractive, don't they? Could I squeeze you a bit, David? Could you do them for 20? So, deal done very decisively, but he's still on the hunt. I'm quite tempted by this. It's a chamber stick, but a very utilitarian fellow, isn't it? -So, you could have gone up to bed with that. -It would do, yes. It would look lovely. but James still has the bargaining instinct of a city slicker. For all my smiles, David, I'm still a hard man underneath it all. -Could you help me out? Could you do it for 18? -20 is really the rock bottom on that one. -OK, 20's the rock bottom. -Oh, he's as hard as me, that David, isn't he? 20. I'm still going to take the gamble though. -Right, I think I owe you some money, don't I? Do pay the man then, James. He takes the cranberry glasses and the candlestick for a total of £40. Anita, meanwhile has travelled on to Finchingfield in Essex. She's got all her lots for auction. in the house's ancient past. She's meeting the owner Sir Timothy Ruggles-Brise. That's quite a name! -Hi, lovely to see you. What a wonderful, wonderful room. have owned and lived in Spains Hall since the 1760s. that stretches back to the Norman conquests of the 11th century. the Kemps, which Anita's here to learn about. and it's a tale almost worthy of the bard himself. accused his wife of being unfaithful. was so ashamed that he took a vow of silence. but still he persisted with it. I think I know where this story is going. were visiting a neighbouring village and it was a very stormy night. overheard a band of ruffians plotting to rob Spains Hall. warn his staff of the impending robbery. and the staff thought, "The squire must be in dire trouble. a relation of the Kemp family, here in the house. This is a catalogue of disasters indeed! He shouldn't have taken that vow of silence. on that rainy night, soon encountered trouble of their own. never to be seen again...well, not quite never to be seen again. and these plates have now returned to their rightful home. of the plate-laden lake as it is today. And is that the actual lake that these wonderful plates were found in? -That must have been a very exciting moment. -Well, it was 1904, a bit before my time. I may not look it, but it was! My late uncle, Sir John, he was born in 1908. So, he just missed it. -He just missed it as well, but it must have been very exciting. a conclusion in the 20th century. But it's time for Anita to be heading onward. It's been fascinating. I have absolutely loved this house. James, on the other hand, has motored on to Sudbury in Suffolk. 18th century painter Thomas Gainsborough hailed from the town. presided over by the proprietor who is, oddly enough, called Mary. -Hello. Nice to meet you, Mary. -Cor, how long have you been here? -Oh, it looks wonderful. A lovely old building. -Yes, it's quite a nice old place. -Well, I'll have a squizz round. -Yeah, you have a look round, by all means. This is a sort of coal bin. Quite a nice piece of brass, isn't it? I don't think it's terribly old, but it's not a bad weight. It sort of feels as though it should be Edwardian. -That's quite nice, that one. How much on this, Mary? -20, you can have it. -And you want £20 for that? -And I'll give you £20 for that. That's very kind of you. Thank you very much indeed. Thank you. And a very civilised deal to end on, James. And now they've both got all their lots for auction. our excellent experts to reveal their purchases to each other. I'm dying to show you what I've bought. Can I go first? -Yes, go on. Go first. -OK. I'll have to do this quite gingerly. -Hey! Something from the homeland. -Oh, yes, some Scottish brooches. Two little agate ones, polished agate, and two little Iona ones. because we are in a little... "Deux CV". -And do you know something, James? Heh, heh! I'm not sure I see the resemblance. -Who's this made by? Is this Portmeirion? And 20 quid on this. I'm sensing a theme here. Now, what about James' haul? -Nice Arts and Crafts candleholder. What about this guy here? Not a hit, I fancy. -I bought them for £5. but what do they have to say behind closed doors, one wonders? It's a bit spooky. We both seem to buy units in £20 sums. and her lovely statue of Napoleon. I think that's a nice item. I could do well, or I could just lick my chops. but he hasn't done that, he's been very, very canny. a moment of madness, James! the village of Stansted Mountfitchet in Essex. and an ideal place for them to auction their wares. -Here we are, James. Do you think we're fine here? The morning struggle out of the vehicle. Sworders Fine Art Auctioneers was established back in 1782.
and auctioneer Frank Barnett will be presiding over proceedings. But, before the off, what does he make of James' and Anita's buys? it's the sort of thing that doesn't particularly set the world alight. Anita started this leg with £324.14. She spent £135 on five lots. While James began with £465.40. spending on £105 and also has five lots in today's sale. And now the sale's about to begin. First up, Anita's job lot of Caledonian brooches. Can they pin her a decent price? -£65, bid at £65. 70, anyone else? Selling at £65. It's a patriotic winner for our lively lassie. -It's a good start, isn't it? Now James' stamp books from the '60s and '70s. Please, Mr Postman, a profit for him! Anybody want the stamps for £10? -Oh, dear, this doesn't bode well! Anybody want them at £5? More like return to sender! Ha! so he'll have to carry them on to the next leg. but Anita has another try now with her pretty Art Nouveau glass vases. Who'll start? £20 for them. Selling at £55. All finished at 55? My friend is on fire! -I didn't expect them to go that far. Next, it's James' Arts and Crafts chamber candlestick. Will it attract the punters' brass? £10? £10 is bid. I'll take 15. The lady's bid at £25. Selling at £25. All done at 25.
auction costs have been deducted. All the way from China, it's Anita's mah jong set. -£20 is bid. I see 5 now. £50 is bid. Selling at £50. All done. And the game certainly seems to be in Anita's favour today. as her incomplete Portmeirion coffee set is up. £10 then. £10 is bid. I'll take 15 now. I've £10 bid. I'll take 15. Well, it doesn't look as if it was the crowd's cup of, huh, coffee, eh? I tell you, James, I deserved that one. -Did you...? Slightly, you felt that, didn't you? but was it a rose-tinted buy? £10 is bid. Do I see 15? I've 15. Do I see 20 anywhere? 20? The lady's bid at £25. £30 anywhere? This is for a set of six. and it's his Edwardian coal bin next. £20. £20 is bid. Do I see 5 anywhere? 25.
but it's a welcome profit nevertheless. -It's all down to my picture. her brass figure of Napoleon. £20 I'm bid. Do I see 5 in the room now? It's a figure of Napoleon. 25. 30. 5. Will you go 38? 40 is bid. -Do I see 5 anywhere else now? It's her very own personal Waterloo. I'll tell you, James, it could have been a lot worse. -Yeah. Were you relieved with that? You're a brave soldier, Anita. James' attractive oil of a Norfolk boatyard. 20 then? £20 is bid. At £20 I'm bid, do I see 5 anywhere now? At £20 is bid. 5 anywhere else now? Are we all finished then at the maiden bid of 20? All done? And, with that, he's sunk. -It's a bit of a disaster, that. -I think that was bad luck. Bad luck on that one. -It's a combination of errors, I think, that one. and is nipping at his heels. James started this leg with £465.40. £23 and now has £442.40 to carry forward. -Well, James, you won't mind if I have a wee gloat? -Well, we both played it safe. -And safe wasn't good for you, James. -I think I'm looking forward to seeing you as a wild man! Safe did not work for me today. Well, we'll look forward to that. To the next leg and away. And even James is getting on down.